The objective of the organization shall be : To organize existing A.K.C. recognized Beagle Clubs so that all member clubs may share in the benefits which may arise as a result of their support. 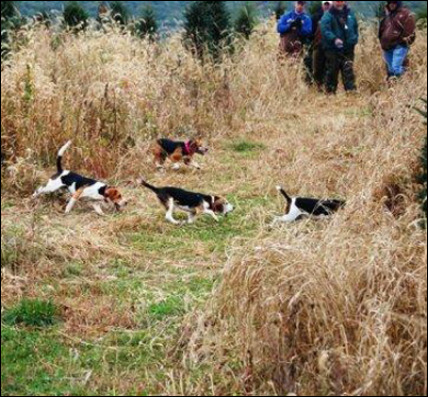 ; To promote and develop the sport of Beagle Field Trials as they are written in the Running Rules and General Procedures adopted by the A.K.C. and this Association. ; To encourage the cooperation between this Association and other Associations and / or Federations, so near as possible without violating the provisions of this Constitution and By Laws as they are written; To promote various programs accepted by the Association, which are designed to offer local, state, regional and / or national competition. Also there is a NEHBA Special meeting to commence during this trial, major topic is NEBGF Champ trial amongst other items. There will be an AKC Judges Seminar at Berkshire Beagle Club on Saturday, August 3rd, 2019. If you are interested, please send your name and number to Rob Kane and he will add you to the list. Cost for the class is $25 (Free if a member of the NEBGF). This will run in conjunction with our Beagler's Weekend, which more will be coming out about shortly. Thank you to Blaine Grove and Blue Ridge Beagle Club for making this happen! Is your dog already AKC registered? Now you can transfer the recorded ownership or update the existing ownership.